The growing popularity of tungsten rings means that more products are coming onto the market at all times. More product choice means that you need to be more careful and diligent with the products that you buy, as it is inevitable that there will be some retailers looking to cash in on their popularity by producing substandard rings, yet trying to sell them at the top of the market price. 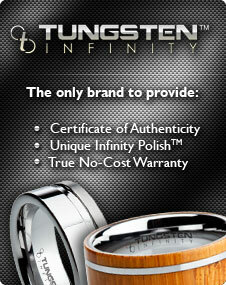 If you know how to quality check a tungsten ring yourself, you can avoid the imposters. Tungsten rings will rarely be 100% tungsten, as on its own the metal can be difficult to forge into a ring. Therefore, most tungsten rings will be tungsten carbide rings. Most sellers of tungsten carbide rings will have them labeled simply as ‘tungsten rings,’ but it is always worth checking just to make sure. Tungsten carbide is an alloy, and it is best to check what metal has been mixed with the tungsten in order to create it. The best, most desirable tungsten carbide is created by mixing tungsten with carbon, so you should always target these types of rings. Cheaper tungsten carbide rings might be made from cobalt, although these will discolor your finger in the way cheap jewelry is known to, so are best avoided. If you have purchased a tungsten ring with an inlay, such as meteorite or caribou antler, look at the detail and the finish of the ring. A high quality ring will be ‘seamless’ and look as if the inlay has been naturally found within the tungsten carbide. In the event that you come across a ring where the ‘seams’ are not parallel, or you can feel where the tungsten carbide meets the inlay, then the correct level of care and attention has not gone into producing the ring. An additional feature to look out for is any engraving work that you have done on your ring. Ideally, you will have checked this before making your purchase anyway, but tungsten carbide engraving should only be done by laser, not etched as a traditional jeweler might do. A top quality tungsten carbide ring will never lose its shine. Check your ring by trying to smudge and mark it; if it resists, then it is a good one. If it smudges easily and loses its shine within minutes, you know you have a poor quality product on your finger. Cost should not be the be all and end all of your decision to buy a ring, but it can generally be a good indicator of quality. Tungsten carbide rings made with tungsten and carbon will not be available for anything less than around $190. If you find rings that are cheaper, the likelihood is that they are made with cobalt or another material, giving you a poorer product. One final check that is always worth doing is to speak to the person selling the ring, whether they are in a shop or you are buying from a website. The idea is to discover which rings are the poorer quality. If anyone is vague or says they do not know what their rings are made from, look elsewhere. The best sellers of quality tungsten carbide rings will be proud to explain how their rings are made, and the whole process that surrounds production.